The 1794 Flowing Hair Half Dollar is one of the most valuable coins in American numismatics. The first United States half dollars were minted sometime during the last few months of 1794, when the Mint released 5300 pieces of the Flowing Hair type. Another 18,164 were struck in 1795, using 1794 dies. Thus, only 23,464 of the 1794 Flowing Hair Half Dollars were minted, and of this number, survivorship is low. This is one of the most significant coins in all of American numismatics. Unrelenting price increases over many years proves it as a fact. The 1794 Flowing Hair Half Dollar pictured below appears to have scratches across Liberty’s face. These are actually what are called adjustment marks, made by a Mint employee before the coin was struck. In the early years of the Mint, if a silver or gold planchet (i.e. blank) was a little overweight, excess metal was manually removed with a file. The file marks usually were erased during the striking action, as metal flowed over them to form the coin's features. This half dollar example is one case where evidence of file marks remain. The 1794 Flowing Hair Half Dollar has one of the best value increase histories of any rare United States coin. The blue line above charts the percent increase since Year 2000 of the 1794 half dollar, in G-4 condtion. It goes off the charts, in relation to the Rare Coin Values Index, (red line) which charts the collective percent change of a pre-selected group of 87 rare US coins over the same time period. The 1794 half dollar hit its highest point in 2009 (Index score of 560, or 5.6 times its Year 2000 value), just as the US rare coin market reached its zenith. 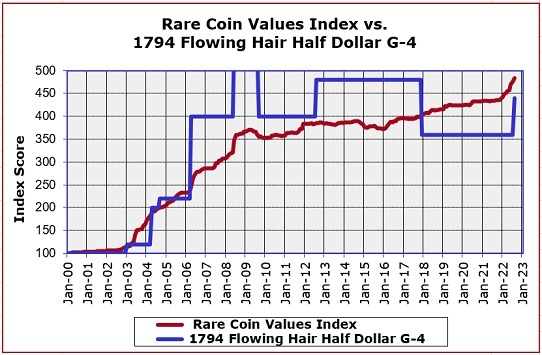 The 1794 Flowing Hair Half Dollar is one of the coins tracked in the Index, which is updated monthly.